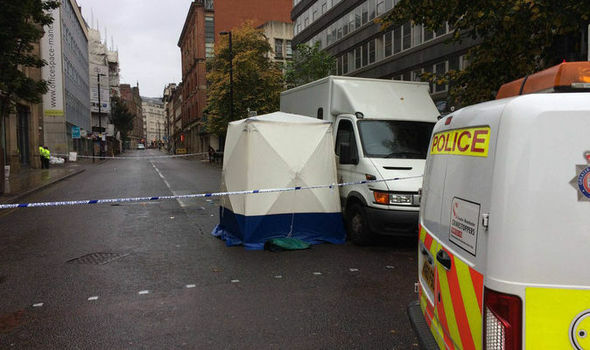 The man was knifed in the neck near Deansgate in the city centre early this morning and died from his injuries. Police say the “shocking” violence flared after a fight broke out in the Suburbia nightclub. The fighting then spilled out into John Dalton Street with one man being stabbed, another smashed with a glass and two young women knocked unconscious. Two police officers were also attacked during the inciden, leaving them with minor injuriest. The street is close to the Midland Hotel, the venue for this year’s Conservative Party conference. Four men, aged between 19 and 24 have been arrested following the brawl. Chief Superintendent Emily Higham from Greater Manchester Police’s major incident team said: “What we were faced with during the early hours of this morning was a large group of men and women fighting in the street. “Sadly, a 21-year-old man has lost his life, my thoughts go out to his family at this unimaginably painful time. “We are appealing for anyone who witnessed the fighting to get in touch as soon as possible. We believe the fighting started in the Suburbia nightclub and spilled out onto the road, so there is potentially a nightclub full of witnesses who we want to hear from. “There is currently a scene in place and some road closures in the area.